Ivory silk brocade of gold thread with floral pattern; trimmed with silk tulle, Brussels lace, beads, and imitation pearls; 240cm-length train with fifteen tiered flounce. 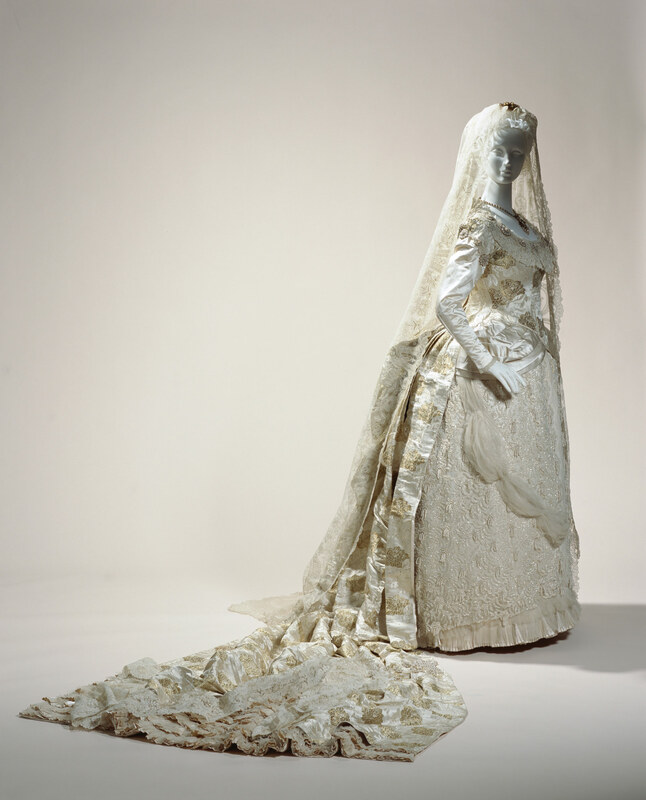 This wedding dress of luxurious silk brocade demonstrates the latest trend of its time, the bustle style. The abundantly gathered draping, as well as the ornaments concentrated with lace, flounce, and embroidery techniques that decorate the 2.4 meter-long train indicate that the wearer was a woman of the upper classes. Traditionally, wedding gowns in the West were not limited to using the color, and brides simply wore gorgeous, fashionable outfits. However, from the 19th century onward the use of colors in shades of white to signify brides' chastity became the standard. Veils of lace and tulle were also in vogue, and in the latter part of the 19th century were so enlarged as to envelop the bride's entire body.